Communique provides a wide range of transcription services to many of the UK's legal 100 and 500 law firms, assisting during court hearings, interviews, ADR and much more. Experienced and qualified stenographers available to attend court and produce an accurate verbatim report of proceedings using a stenograph. Demand for Stenographers attendance is high and we strongly recommend confirming your requirements with as much prior notice as possible to avoid disappointment. Expert court reporters attending courts throughout the UK on a daily basis to produce verbatim transcripts taken from proceedings for a variety of law firms specialising in criminal and civil matters. 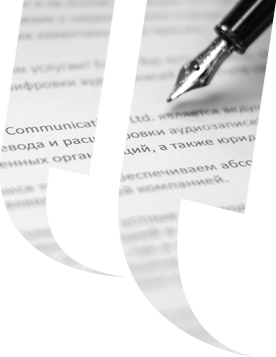 Professional in house writers offering the utmost confidentiality in producing accurate verbatim transcripts taken from PACE audio provided to us in any format. Further to the above core service offerings, we also propose a range of summaries which can be tailored to meet the requirements of our clients. Our transcription style guide outlines the various styles we can adhere to. All Stenographers, Court Reporters and writers working with Communique are bound by our company NDA and we are happy to review and agree to the same provided by our clients at their request. For further information regarding our legal transcription services, please feel free to request a quotation or contact us.